Monel 400 bars offer excellent quality for use as heavy duty construction materials and can withstand high pressure & weight. These bars are used in various types of mechanical, structural and general engineering applications. These bars are suitable for use in cement, oil, mining, gas and nuclear power plants. Monel 400 is a solid solution alloy that can only be hardened by cold working. Monel 400 has excellent corrosion resistance, high strength and excellent weldability due to which it is widely used in various applications such as gasoline, chemical processing equipment, crude petroleum stills, fresh water tanks, propeller shafts, de-aerating heaters, boiler feed water heaters, electrical & electronic components, valves & pumps, process vessels & piping, marine fixtures & fasteners and heat exchangers. Monel-400 can withstand corrosion however pitting corrosion occurs when it is exposed to stagnant salt water such as seawater. The corrosion rate of this alloy decreases with increasing nickel content. Monel 400 alloy is used to handle sulfuric acid solutions under reducing conditions. The corrosion rate of this alloy is very low at all temperatures in air-free solutions and aeration increases the corrosion rate. Monel 400 alloy has resistance to corrosion by various reducing media and can be used in contact with hydrofluoric acid, fluorine, hydrogen fluoride or other derivatives. This alloy has high resistance in all concentrations of hydrofluoric acid up to the boiling point. Monel 400 bar offers resistance to various forms of sulfuric & hydrochloric acids under reducing conditions and has good behavior in seawater. Monel 400 alloy allows typical forming, shaping, joining and machining operations to be used in its fabrication. Hot working operations are performed in the temperature range of 1200°F and 2150°F. 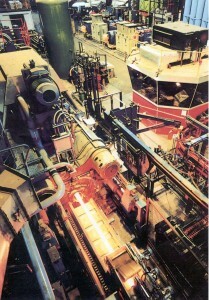 Heavy reductions are done in the temperature range of 1700°F and 2150°F. Cold working can be performed on annealed material. There are various heat treatments available for Monel 400 alloy depending upon the mechanical properties needed such as stress relieving, stress equalizing and annealing. Stress equalizing is performed for a period of 3 hours at a temperature of 575°F and then a rapid quench is performed. This is performed to increase the yield strength without affecting other properties. Monel alloy as a nickel-based alloy containing between 29 and 33 percent copper is used in chemical plant equipment due to its high resistance to chemical corrosion. This alloy is also used in aerospace industry and products made of Monel are wind instruments, fuel, kitchen sinks, screw machine products, piping systems, heat exchangers, water tanks and roofing. Beautiful appearance & finishes including a gray-green patina similar to copper. Available in various forms such as plates, bars, hot/cold rolled sheets, rods and tubes. Oil-well tools, doctor blades & scrapers, valve trim, marine propeller shafts, pump shafts, instruments, springs, fasteners etc.